One of the best locations Silverton has to offer! This beautifully designed home is situated on the bank of the Animas river located on the OHV route heading up Kendall Mountain. 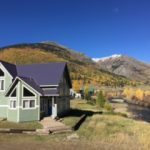 It is the closest property to the Kendall Mountain Recreational Ski area and only a short walk to everything that the town of Silverton has to offer. The 1600 square foot home provides a newer build, two story wall of windows, and views from every window in the house. The house has two bedrooms and 2 baths. The master bedroom is an oversized loft that has a king bed, pull out twin sofa, roll away twin memory foam bed, an air mattress, large walk-in closet and a 3/4 bath. On the main level there is another large bedroom with a queen bed and another roll away twin. The large living area also has a pull out couch with a queen memory foam bed. There is an adjacent full bathroom as well. From the garage, you enter into a mud room that has a washer and dryer with plenty of room to dry out wet gear. The open kitchen is ideal for entertaining with a table large enough to sit eight. Sit back and relax with a cup of coffee by the gas fireplace and enjoy the view of the Animas River just 20 feet away with 13,000ft mountains in the background. You can enjoy all of your favorite music from your device with the convenience of a bluetooth enabled sound bar, or watch movies with Netflix, Hulu, Pandora, etc. from the wall mounted 40 inch smart TV. Free high speed Wifi. For the kiddos, we provide a pack and play, a portable high chair and an umbrella stroller. Park all of your toys in a lockable large two car detached garage equipped with a tool bench and pleatly of area to get your gear ready for the next adventure. The Kendall Mountain Recreation/Ski area is a perfect family ski destination walkable from the house with ski boots already on! This recreational area is also popular with wedding events throughout the warmer months and this house would be the ideal location for wedding guests. It also provides a sledding hill and hockey rink in the winter and a bike pump track in the summer. Or for the more adventurous side of you, ski at Silverton Mountain or fat bike on the trails out the back door. Silverton Ski and Bike is right next door for all your ski tuning/repair needs and fat bike rentals. 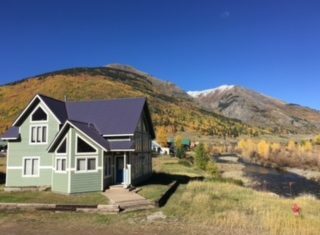 Whatever your idea of enjoying Silverton and the San Juans is, this house and location will suit your needs.